The Bridgestone Battlax BT016 Pro Hypersport motorcycle tires multi-compound technology derived from Moto GP, delivers the grip performance demanded in every aspect – braking, maximum side grip in cornering, and strong traction at the exit of a corner. Comprehensive Tire Design Method is an advanced tire design technology that enables dynamic, three-dimensional simulations of tire performance at all lean angles. High Tensile Super Penetrated Cord – Mono Spiral Belt technology in the front and rear tires provide a rich contact feel, strong grip and high-speed stability. 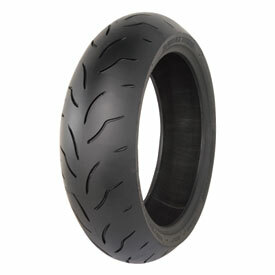 The rear motorcycle tires L shaped grooves enhance shock absorption and rear-end steering. Groove location across tread center area provides both wet performance and strong traction. High speed durability is also maximized. Rear motorcycle tire features a new triple compound (5LC). The center compound offers good stability, the shoulder compound transfers power to the road with strong traction while the edge compound offers strong side grip and solid contact feeling at extreme lean angles. So far about 2,000 street miles on my set, and one track day and this is the condition afterwards. Extremely good grip, only took 45-60 seconds of the first lap to get heat in them and they stick. This is a great tire but not as sticky as I would like. 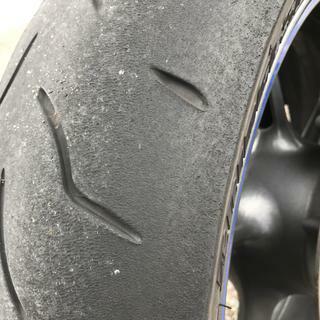 I used the Bridgestone BT003 and S20 which seems to be stickier. I mostly ride twisted mountain roads. When the front is worn a little I can feel it slipping. First off Thankyou to this company for carrying this tire. It was discontinued but I loved it on my bike ( 2016 Yamaha fz-07). Ran over a huge nail last week. Didn’t want 2 different tires in my bike. So I hunted and found it. Absolutely astonishing deal for the price. As well I must say hats off to this company for shipping it to me three days before the estimated delivery date. You’ve just earned a new customer for future purchases. Love these tires, use them in the canyons and for daily use on my gsxr. Literally rode in tornado weather with them, rain and hail with wind speeds of 60-70mph. Didnt slip on the road and held up great. Almost no break in period. Stick like glue and you can not beat the price. I've run these on my RC51 for years now on the street and really liked them. I've never run them on the track, but my experience with them in NW Arkansas was very good. I bought this last set for my V4 Tuono and expect excellent results. Excellent tire for the Price! Excellent Tire for the price. It is a softer tire, which those who are knowledgeable with tires know it does not have a good tire life as well as some of the other options out there. 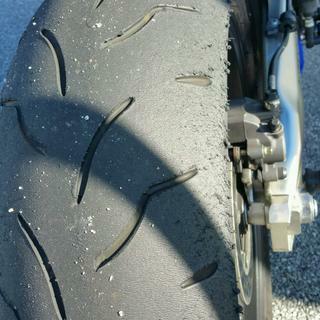 This tire came on the bike from the manufacturer on my 2014 Suzuki GSX-R 600, front and rear. I replaced it around 6,500 miles which is a fairly decent tire life from what I’ve heard. Traction around corners is excellent! I can not complain one bit as it loves to hug turns being this is a triple compound tire. It is an older generation of the tires out there, but being that Bridgestone has been the biggest sponsor for MotoGP, there is a lot of MotoGP engineering used for this tire. It’s a great tire for the price and I do recommend for those other canyon carvering riders like myself. Has somewhat good wet traction. Was caught in a random rain storm with high winds and heavy rain and it was not too bad. Still hydroplaned a bit under highway speeds. Off the highway, it hooked up well on normal roads. This was the stock rear tire for my 2014 bmw s1000rr. The price was unbeatable. This tire is selling for $280.00 around other places. I couldn’t believe I got it from you guys for $114.00. Delivered in two days and was exactly as described. Counld’nt beat the price or the free shipping. Rocky Mountain will definetly be doing business with me again. Had this tire on a cbr 1000 and it holds up great. It was soft enough to corner great but the compound in the middle was hard enough to not wear to soon. Would definitely buy again. Great performance. Just did 1K miles on some of northern California's twisty roads and couldn't be happier with the way the tire performed. Love the tire it's great for mileage.. you do get a small flat spot over time tho but that's expected if you ride the highway a lot. Grip isn't too bad, had them slip out a few times in the turns even after warming the tires up and pressures set at 30 psi cold. Mileage on a 600cc you can expect 7500 miles out of a rear, that's how much I got.. it is possible to get more but I ride hard and use lower pressures. Never rode with them in the rain so I can't say much about that. Overall not a bad tire for the money, would buy again. Excellent tires especially at this price. Just came from the Bridgestone s21 and only picked these up for the great price and I love them. I really can't tell much difference between the s21 and these. I don't know if the longevity will compare to the s21 but the feel and grip is very similar. For the price these have to be about the best tires you can get. Very very happy. Thank you Rocky Mountain ATV/MC. Always a goo tire. Have used them for a while and they always perform great. Super fast shipping with tracking great quilty for great prices. All my mc tires will be purchased with this company thank you. 06 cbr 1000rr is my bike. This set of tires lasted me my track day season. 8 individual track days and I flipped them about half way. I also have so much tread life for the street. I could probably get 5k more if I rode on the street that much. 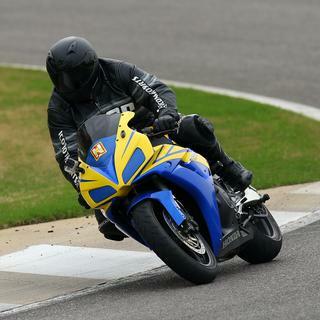 With a ZX12R that chomps rear tires every oil change if not sooner value is my biggest concern. Great grip, handling for the price. I never expect much life because of how I ride but these are cheap enough to shred with no hardships. 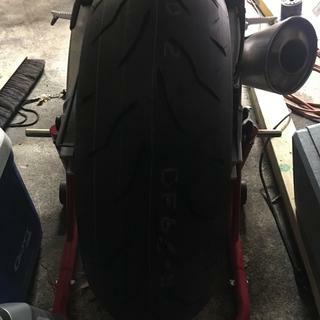 I went through 5 rears and 2 fronts on my busa using the Battlax BT-016. The tire holds up to the my riding style (passive aggressive, no chicken strips on the rear, 3/8 in front). Sticky enough where the only time I slipped was on the cross walk paint accelerating into a right turn at the intersection. The fronts last 7000-8000 miles the rears about 4000-4200 at factory pressure. I noticed cupping on the front after 6000 miles but they are still safe and ridable to my standards. No wet riding experience - in Nevada. Rocky Mountain ATV is the least expensive. Bridgestone provides $50 cash card once in a while which comes in handy. I love these tires. Of course tire preferences are totally subjective but I feel you can't go wrong with these tires. Pretty good wear life for a sport tire and they give me a ton of confidence when riding hard. I know I can trust these BT-016s and that's why I keep putting them on my bikes. Solid tire, great traction and stability, four stars due to longevity, got right around 5000 miles out of this tire, could probably get more with a little less throttle. My bike came stock with BT016 Pro's and although I did consider switching them out for something different, I put a new set on. This tire does just about everything right and wears very well. With over 6.500 miles on the original rear tire, and subjected to all the power my bike puts down, these Battleaxes are have proved great for both the street and occasional track day. The service (lightening fast free shipping) and price I received from Jake Wilson has made me a lifetime customer. Hade the stock BT-015's on when I bought the bike, got about 2500 miles out of the rear, really unhappy with that. But I decided to give Bridgestone one more shot. The BT-016's was way batter. I'd buy this tire again. These tires last well with the dual compound. I get several thousand miles more on a set than most other tires. Most others wear out in center a lot sooner than these. Probably not as sticky as some others, but a good tire nonetheless. I had this on my KTM Super Duke and the duel compound held up great for daily commuting along with great traction for riding in the mountains on the weekend. Tire sticks very well ran this tire for 2 years. Even had others change after they seen what it can do. Cheers! This tire is amazing . Good even wear . Perfect for track or street use . Have about 4k on the set. rear is just about gone. front is a little past halfway, alot of highway miles, some hard excellerating but nothing like the track. Great stability in corners, rode in cold rain and hot weather. Would buy again. 've run several different tyre makes on my Buell including the Corsas fitted when the bike was new and though all were great when new, I did noticed a loss of handling and reasurance once they'd got down to half wear. I'm now close to the end with the Battlaxes and they simply haven't missed a beat. Nice to be still using the entire outer edge of a tyre this late in it's life and the few times I found myself comming in too hot on a wet bend , found they did exactly what Bridgestone said they would. My next choice of tyre is already made. I'm using them front and rear and seriously can't recomend them enough. Awesome grip for my commuting fun! Life is going to be about 6000 miles before too flat in the middle. This is a great tire, both front and rears. Semi Soft, yet I get a decent amount of miles out of my CBR 1000RR and especially my SV650S with them. I have bought nothing except these, and will continue to do so until Bridgestone gets a better tire for me..
What the dot date range I can expect with my purchase? BEST ANSWER: Tires between 5 and 6 years old are still considered new off the shelf. I can't guarantee a specific set of dates for this tire, but most likely it's less than 3 years old.